For years, JVC Professional Video has quietly led the way for IP acquisition. Additionally, they continue to assist in reshaping the process of video production workflow design. 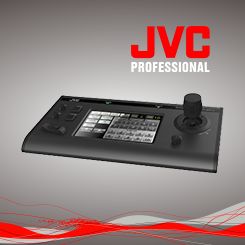 JVC focuses on the versatility and flexibility of working in a variety of environments. Above all, JVC remains committed to bringing feature-rich products to the market, while continuing to provide unparalleled value. With a renewed commitment to quality manufacturing, and an emphasis on IP-based workflows, JVC has a solution for any challenging video production scenario. Because of their forward thinking—likewise, their ability to integrate a camera, monitor, or bonded cellular solution into almost any workflow—Stream Dudes highly recommends and uses JVC Professional Video products on a daily basis. 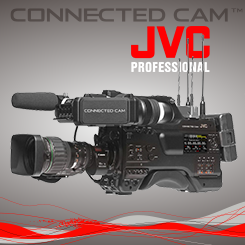 JVC Professional Video provides full video solutions for the creation of robust, reliable and simple-to-use infrastructures. Lets start with cameras that feature built-in encoding and web streaming capabilities. With this solution, content producers are no longer bound to fixed locations. This is certainly an improvement over traditional, hardwired workflows. JVC now is looking toward the future by embracing the benefits of video over IP. They are developing innovative products that easily can allow the sharing of video across a studio, or across the world. The industry's most connected camera. The GY-HC900CHU is a unique and innovative broadcast camcorder equipped with a new powerful communications engine that truly makes News-over-IP a reality with a streamlined ENG workflow that's both reliable and cost effective. 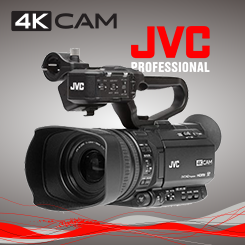 This full-featured professional camcorder delivers stunning 4K Ultra HD video, the ability to stream full HD live to the web, and the ability to add custom, integrated graphics to your recordings or live streams without an external CG or production switcher. The KY-PZ100 is a robotic pan, tilt and zoom (PTZ) video production camera. 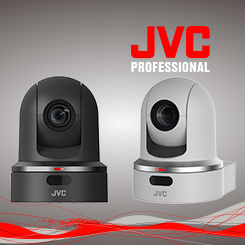 It's the first PTZ camera that features JVC's unique IP communications engine providing network connection via Wi-Fi*, 4G-LTE*, or cabled LAN. It's designed to be used as a stand alone remote camera or as part of a multi-camera system in both studio and field environments. Carry it anywhere! 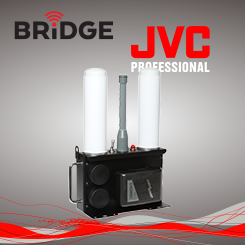 This portable bridge is a powerful bonded cellular hotspot that features Peplink's patented SpeedFusion™ technology that allows you to reliably stream your JVC camcorder signals to any destination on the internet. Unlike typical bonded solutions, the PB-CELL200 enables you to stream live video from multiple cameras to HD-SDI decoders or servers at a central location. Video streaming and JVC products are a natural match. It is because this match that Stream Dudes can offer great IP-workflow solutions that fit within any budget or need. This deep knowledge of IP video allowed our co-founder to become the logical choice for explaining the benefits of JVC’s unique IP capabilities. For more information or to have one of our product specialists help you find the right solution, Contact Us for more information.